It was the coldest part of the morning as Lori headed down toward the Beaver Mountain Lodge aid station during The Bear 100 Mile last fall. With temperatures hovering in the teens and low twenties Fahrenheit, you have to be quick or the warmth of the building will keep you inside, and so she forged on, 75-plus miles in. After a quick descent, the trail climbs steadily for 1,600 feet, one of the final few punches that come at Bear runners in the last 20 miles of the race. As the trail flattened out before the last push to the Beaver Creek summit and she tried to switch to a run, Lori realized that she wasn’t just breathing hard from the climb, she was struggling to breathe at all. Thinking it might be compounded by dehydration, she consciously took in more fluids and thought about another runner she had met 30 miles earlier who ended his race at mile 50 due to asthma-like symptoms that had “come out of nowhere.” What was going on? Lori had previously been tested for asthma and exercise-induced bronchoconstriction, or tightening of the smooth muscles of the airways, without conclusive results. She is also an experienced ultrarunner who had never had this type of wheezing constriction before. She was smart, she didn’t panic (although that might just be ultra brain), and she limited her running to the downhills where the wheeze and discomfort were most manageable. Since that day last September, she’s had no other breathing issues while running or racing, but with more high-altitude 100 milers on the horizon it’s something still on her mind. Since the 1980s, there have been a multitude of terms coined in an effort to describe the asthma-like symptoms that plague many athletes like exercise-induced asthma, skier’s asthma, hockey hack, cold-induced asthma, exercise-induced hyper-reactivity syndrome, and a new one to me, the Hardrock  cough (1). For years, research was focused on winter athletes training and racing in primarily cold conditions when these asthma-like symptoms most commonly arose. An entire theory emerged based on the cold taxing our respiratory system, and the scientific community ran with that explanation of events for a long time. However, it soon became apparent that athletes exercising in hot, dry, and even indoor environments were also experiencing these asthma-like symptoms without a corresponding clinical asthma diagnosis. What we now know is that there are at least two main respiratory conditions that affect winter and summer athletes alike. These fall outside of an asthma diagnosis and are classified as airway dysfunction. These conditions are most commonly called exercise-induced bronchoconstriction (EIB) (which was formerly known as exercise-induced asthma), exercise-induced laryngeal obstruction (EILO) (formerly known as vocal-cord dysfunction), and high-altitude cough (HAC). 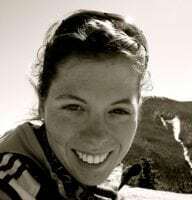 There is one more condition that has been recognized by the medical directors at the Hardrock 100 that mimics EIB and presents very similarly to what Lori experienced last year at The Bear. At this time its pathophysiology remains unknown, which places it squarely in its own category. For the time being, it’s simply, ‘a pulmonary experience of the Hardrock 100,’ and it’s fascinating! The purpose of this article is to dive deeper into what EIB, EILO, and HAC are, risk factors for developing airway dysfunction, and how those factors play into our day-to-day lives as ultrarunners. As always, if you believe you have a respiratory condition, please seek medical assistance from your health-care provider. I do encourage you to comment to this article about your personal experience, too, since connecting with other runners who experience similar pulmonary events helps share our collective knowledge. Exercise-induced bronchoconstriction (EIB) is a condition that can occur during or more commonly up to about 15 minutes post-exercise. During exercise, there is an increase in ventilation, the rate at which you are breathing, and in certain individuals there is a subsequent narrowing of the bronchi and bronchioles, the branches of the air passages in your lungs, causing a restriction of airflow (2). 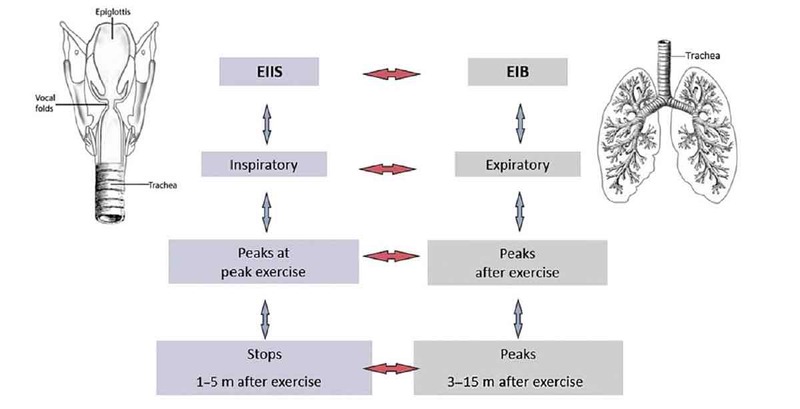 Previously known as exercise-induced asthma, as it was once believed to be most prevalent in the asthmatic population, it is now clear that EIB symptoms are not always consistent with classical chronic asthma (1). Essentially, many athletes who have asthma may experience EIB, but not everyone who experiences EIB has asthma. When you exercise and you’re breathing hard and fast, this causes water evaporation of the airway surface liquid that makes up the lining of your bronchioles. This causes a shift in osmotic gradient, or the movement of liquid, during and post-exercise, which stimulates the release of inflammatory mediators. Inflammatory mediators, like histamine, can influence the bronchial smooth muscle and cause constriction, mucus build-up, and edema (1). It’s believed this occurs due to excessive calcium being released as cells shrink due to the shift in osmotic gradients in response to the increased evaporation occurring during exercise. Although more prevalent in winter athletes, EIB is not exclusively a winter-athlete problem. Although cold, dry air is the most widely-talked-about cause, pollutants, allergens, particulate matter, nitrogen oxides, and the ozone pose equally adverse threats when ventilation is increased during exercise. Olympic swimmers exposed to chlorinated pools, speed skaters and hockey players exposed to ice-resurfacing-machine fumes, and cyclists exposed to a wide variety of air particulates on the road report a prevalence of EIB equal to or greater than the rates seen in the most traditional EIB-causing sport, cross-country skiing (3). This is relevant to runners training through brutally cold winter months, wildfire-smoke-filled summer months, inversions trapping pollutants and causing poor air quality, and many other potentially adverse training and racing environments. The concern is that repeated exposures to cold, dry, irritant-filled air has been shown to cause a remodeling of the parts of the lungs’ basement membrane, causing an increase in thickness of these membranes (3). When this occurs, the body has a reduced capacity to respond to water loss of the airway liquid surface by evaporation (1). It is believed that this chronic exposure to cold and/or dry air and the subsequent remodeling of the airway may in fact be irreversible, leading to a chronic and worsening EIB. The demands we, as endurance-driven athletes, place on our pulmonary systems are immense, sometimes exceeding the capacity of that system. Even the slightest impairment to the pulmonary and/or respiratory system can result in large performance decreases (4). Airway inflammation and airway limitation appear to progressively develop over a lifetime in many endurance athletes, with 90% of the asthmatic population and 20% of the general population developing EIB (1,3,12). The progressive nature of EIB ultimately leads to a ventilatory limitation during performance as a result of airway-structure changes due to frequent environmental exposure (4). In many ways, think of EIB as an overuse injury of the lungs. What I mean by this is that, generally speaking, though the cells that line our airways have a great capacity to repair themselves quickly, it’s a repeated injury-repair cycle that is believed to be responsible for the airway’s permanent structural changes. This is a slow but progressive process. There are certainly factors that may predispose us to developing EIB including high-intensity activities, history of asthma, allergies, a history of atopy (or being hyperallergic), and allergic rhinitis (an allergic reaction to airborne allergens) (13). Additionally, the environmental conditions we regularly train and race in are known risk factors including cold air, dry air, high pollen counts, pollution, insecticides, fertilizers, wildfire smoke, chlorination, car exhaust, and more (13). 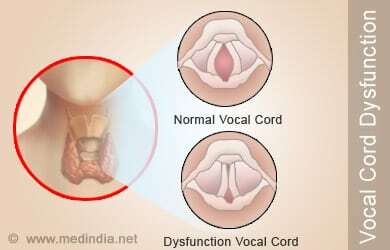 What is Exercise-Induced Laryngeal Obstruction? Exercise-induced laryngeal obstruction (EILO) is defined by a shortness of breath on exertion caused by the inappropriate narrowing of the larynx during high-intensity exercise, which can become more prevalent in stressful situations. The larynx is a part of the respiratory system that both holds the vocal cords and allows air to pass between the mouth and the trachea and onto the lungs (and back again). EILO is most often characterized by its prototypical inspiratory stridor or, a high-pitched whistling noise heard on inhalation (5). Many of those experiencing EILO also complain of accompanying chest and/or throat pain that occurs because the vocal cords are adducting, or closing, during inspiration when they should instead be abducting, or opening, to allow for minimal obstruction of air flow as you inhale (6). Complete abduction of laryngeal structures is normal and required during exercise to optimize maximum airflow when you inhale. When abnormal adduction of these structures occurs, turbulent airflow and increased resistance of the inhaled air results. At the extreme end of this abnormal closing of the vocal cords, you suddenly have a wheezing athlete who is short of breath as they try unsuccessfully to inhale properly (7). EILO is most commonly diagnosed during adolescence, but is also seen in the adult population. Exact numbers are unknown as EILO until recently has been frequently misdiagnosed as other breathing conditions. This is due to improper clinical testing practices that couldn’t differentiate between asthma and other dysfunctional respiratory conditions (7). This has led to much discussion on how healthcare practitioners can differentiate between asthma, EIB, and EILO in a clinical setting. In the field, general diagnosis can rely on the timing of the onset of the pulmonary episode and how/if the condition subsides. Most simply, unlike EIB, which comes on more commonly on cessation of exercise or with a decrease in exercise intensity (change in ventilation rate), EILO generally occurs during peak intensity and will subside on its own within three to five minutes of cessation of activity (7, 5). Additionally, EILO rarely responds solely to the use of a therapeutic inhaler. Successful treatment of EILO with an inhaler is likely the result of relieving the panic and anxiety occurring during the episode, and is effective in getting the athlete to calm down. Therapeutic ‘reliever’ inhalers work as bronchodilators designed to abate the spasms of the airway muscles restricting airflow during an asthma attack and therefore do not physiologically affect the cause of EILO. In fact, EILO is most successfully treated with breathing exercises, which alter the rate and intensity of your inhalations, including inhaling through pursed lips or forcefully through your teeth. Anecdotally, I have witnessed medical staff treating an episode of EILO in the field by having the athlete inhale through a plastic straw. The interesting thing about EILO is that although we are developing effective ways to treat it, as of 2017, its cause still remains relatively unknown. Conditions often linked to EILO include chronic cough, globus (or the sensation of having a lump in your throat), gastroesophageal reflux disease (the movement of stomach acid up into your esophagus), neurological voice disorders, and hyper reactivity of the laryngeal bodies caused by allergies and infections (9,10). Interestingly, there is also thought to be a psychological link to EILO episodes. What this means generally is that stress and anxiety increases the likelihood of an episode reoccurring, and not that EILO is tied to any specific psychiatric conditions (10). Curiously, EILO seems to present more commonly in female athletes with roughly 68% of documented cases being female (14). Unlike clinical asthma, because both EIB and EILO happen in association with exercise, doing a functional exercise test is the best way to get an accurate diagnosis. There are many different varieties of these tests but the key difference is that if the timing of symptoms corresponds more closely with EILO, then the exercise testing needs to be done via a continuous laryngoscopy exercise (CLE) test. A CLE test utilizes a flexible laryngoscope, most commonly a nasal endoscope, that this fixed to head gear and allows for continuous video of laryngeal movement during exercise to take place. This allows for the clearest possible picture into a physical cause of respiratory dysfunction. Another common respiratory culprit is the high-altitude cough (HAC). Unlike the other two respiratory dysfunctions we’ve talked about, HAC is truly limited to one specific cause, high elevations. Most of the current scientific literature focuses on mountaineers in the Khumbu region of Nepal, because HAC is most commonly seen above 5,000 meters (16,400 feet) altitude with increasing severity as mountaineers ascend to higher elevation. However, HAC is an accompanying symptom of acute mountain sickness that effects as many as 30 to 45% of people at elevations as low as 3,500 to 4,500 meters (11,500 to 14,750 feet) and is compounded by the intensity at which the person is moving (11). This would suggest that even outside of Mount Everest’s environs, given the intensity of running an ultramarathon, seeing HAC at many of our high-altitude ultras is not implausible. In fact, in talks with one of the medical directors for the Hardrock 100, Steve Halvorson, MD, he says that many Hardrock participants develop this very same coughing experience each year. In both cases of either the dreaded ‘Khumbu cough’ or ‘Hardrock cough,’ mountaineers and runners alike develop a nonproductive cough likely caused by the interaction of several variables. For a long time, it was believed that the cold, dry air found in these mountain environments was the main culprit, similar to EIB. This same cough is not as frequently seen in a chronic manner in lower-altitude, cold, dry activities. Similar to EIB, it is believed one of the chief causative agents is likely water loss from the respiratory tract via evaporation. However, unlike EIB, other possible causes include sub-clinical pulmonary edema, fluid in the lungs, and—similar to EILO—an additional possible cause is gastroesophageal reflux disease (11). At this point, the exact cause is unknown and it is clear that within in a few days of returning to lower elevation the cough subsides on its own. In most cases, HAC does not seem to have any effects on performance during ultramarathons other than being annoying, though several cases of broken ribs have been documented in mountaineers who are exposed to high-altitude conditions and have this cough for more extended periods of time. What is Happening at the Hardrock 100? Now, what the heck is going on at Hardrock? Having spoken with numerous athletes who have collectively toed the line at The Bear, Run Rabbit Run 100 Mile, Wasatch Front 100 Mile, Hardrock, and Leadville Trail 100 Mile, they have all experienced a combination of one-off and recurrent pulmonary episodes. While recurrent episodes are likely EIB, EILO, or asthma, one-off episodes are inherently curious in their sudden and seemingly unpredictable occurrence. Having heard whispers of this being a particularly common occurrence at the Hardrock 100, I reached out to one of the medical directors for the event, Steve Halvorson, MD. Steve has seen HAC and high-altitude pulmonary events first hand, having helped with high-altitude and HAC research at the Everest basecamp in 2010. When asked about the episodes they’ve seen at Hardrock over the years, he believes, from reviewing the literature and speaking with other medical directors, that the prevalence of pulmonary complaints and drops because of pulmonary episodes seem to be higher at Hardrock, and thus unique in comparison to other races. This is likely due to the extent of the race that takes place at or above 11,000 feet (3,350 meters) altitude as it would exacerbate the ventilation rate and duration at which the runner is breathing hard. Additionally, because of the race’s location, environmentally, it presents many irritants for an athlete’s respiratory tract. Steve and his co-medical director, Geoff Clover, MD, have done an excellent job of drilling down on confounding variables when runners present with pulmonary episodes during Hardrock. By asking questions about the athlete’s history of asthma, reactive-airway disease, EIB, time spent acclimatizing, history of similar problems, recent viral infection (a potential trigger for HAC), and history of high-altitude pulmonary edema (HAPE), they hope to get a better picture of potential causes of these seemingly ultrarunning-at-high-altitude-specific episodes. When examining these preceding variables and their associated symptoms (presence of cough, rales, wheezes, or stridor), there appears to be a lot of overlap with EIB, HAC, EILO, and HAPE. What we don’t yet know is if these pulmonary episodes are occurring at the bronchioles or further up the respiratory tract. The other unknown, fascinating component is that it appears that running for this long in adverse environments is powerful enough to cause a previously asthma-free, EIB-free athlete to experience what at the very least mimics EIB in every way other than it being a one-time event. The implications of this are captivating because of the fact that we do not yet have the answers, and neither does the scientific literature. What does that mean for us, the ultrarunners? It means we get to be at the forefront of wilderness medicine, so help the good doctors out, and breathe deep for me. This article is not intended to be alarmist or fear mongering, or make you rush to schedule an appointment with your primary-care provider. My intention is to add context to situations you might find yourself or your fellow racers experiencing. So what should you do if you are struggling to breathe during a run or race? One, don’t panic! This is where I picture my friend’s mom yelling at me, “But I’m trying so hard to relax!” Ask for help from a fellow trail user or medical volunteer at an aid station. People are there to help. As mentioned earlier, panic will worsen episodes of EILO, so breathe slowly through pursed lips or through your teeth as you evaluate your situation. Two, identify the timing and context of your breathing issues. Although we did not cover every possible medical cause of respiratory issues in this article, when it comes to EIB and EILO, the timing of the onset of symptoms and the timing of how they resolve is largely indicative of which might be the likely culprit in your shortness of breath. Simply remember: onset post-activity or intensity easing off with a long recovery of symptoms point toward EIB, and onset during activity and quickly resolving (one to five minutes) once stopping activity is more likely EILO. Third, ask yourself if your symptoms recurrent and happening regularly after certain activities or during particular weather patterns. If you are noticing any serious continuing or worsening respiratory symptoms, I encourage you to address these concerns with your primary-care provider. Have you been diagnosed with non-asthma airway dysfunction that occurs as part of your running and/or elsewhere in life? Can you share your story? Are you a medical practitioner who has seen endurance-running-associated breathing problems that aren’t asthma? Can you share your observations and what you’ve learned? Rundell, K., & Jenkinson, D. (2002). 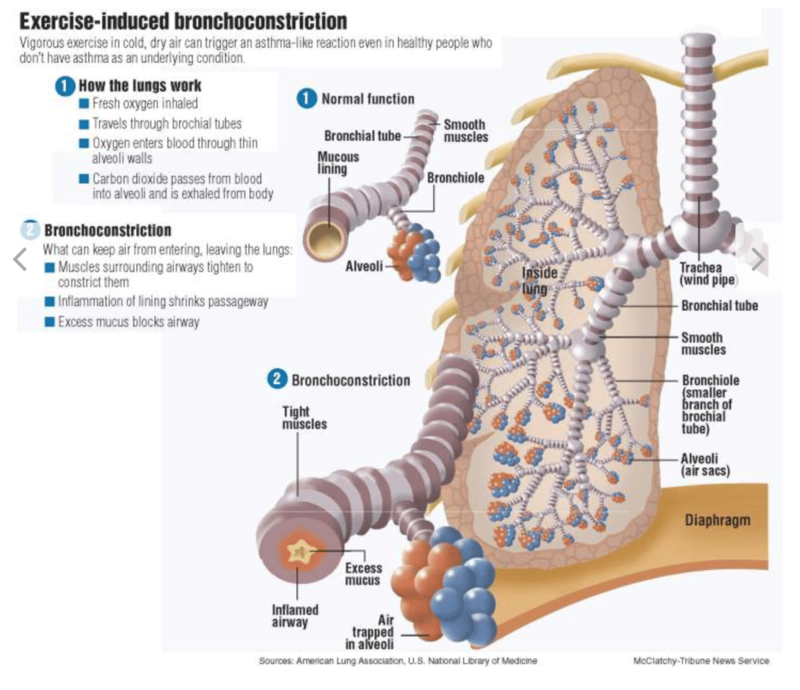 Exercise-induced Bronchospasm in the Elite Athlete. Sports Medicine, 583-600. Parsons, J., Hallstrand, T., Mastronarde, J., Kaminsky, D., Rundell, K., James, H., Storms, W., Weiler, J., Cheek, F., Wilson, K., & Anderson, SD. (2013). An Official American Thoracic Society Clinical Practice Guideline: Exercise-induced Bronchoconstriction. American Thoracic Society Documents. Kippelen, P., Fitch, K., Anderson, S., Bougault, V., Boulet, L., Rundell, K., Malcolm, S., & Mckenzie, D. (2012). 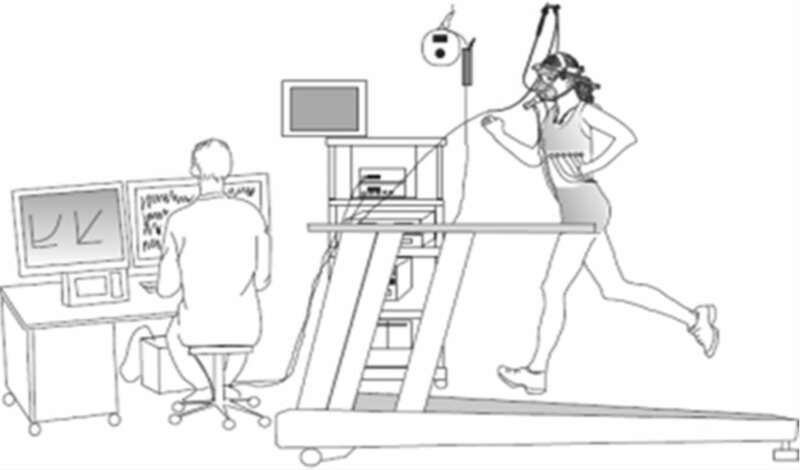 Respiratory health of elite athletes- preventing airway injury: A critical review. British Journal of Sports Medicine, 471-476. Sheel, A., Macnutt, M., & Querido, J. (2010). The pulmonary system during exercise in hypoxia and the cold. Experimental Physiology, 422-430. Boulet, L. (2012). Cough and upper airway disorders in elite athletes a critical review. British Journal of Sports Medicine, 46(4), 417-21. Thanks for the article! This just started happening to me for the first time in over 10 years of training. Freaked me out. Thanks for the article! I am 29, female, originally from PA, and have lived in Boulder, CO for 4 years. In the past two years, I have had issues breathing/can’t breathe from about April to September when I get my heart rate in the cardio zone. I have been very active my whole life, and this is the first time I’ve had breathing issues! I went to the allergist (thought I had asthma!) and he said it was throat irritation and constriction due to hot, dry air & the air pollutants trapped in the Front Range inversion layers (“avoid Commerce City”). He also gave me breathing exercises to relax my throat muscles. Apparently you can do a lot of exercises from Speech Therapists to help? Anyway, not sure if it’s EIB or EILO! Definitely can’t breathe during initial exercise, so maybe EILO. But it’s scary either way! And really frustrating. Thanks for highlighting this unique respiratory issue that ultra runners may encounter. I have never experienced asthma or anything like it and I didn’t have any issues at Wasatch or Hardrock, but have experienced this weird condition for the first time towards the end of, and for multiple days after the Susitna 100 in Alaska this past February where the temps were in the negative Fahrenheit more than the positive. I was completely clueless to what condition I was experiencing and it took a lot of “googling” to come to a diagnosis of cold air induced asthma after my primary doc gave me the “all clear” to what I thought might be pneumonia. I hope this article can help educate other runners before they might experience something similar. I’m an east coast low lander that experienced painful hiccups running Wasatch last year and wondered if it had anything to do with the elevation and, perhaps, it could be related to one of these conditions? I first experienced a condition that sounds somewhat like the description of EIB during my first 100 miler back in 2012. I experienced bronchitis-like symptoms with heavy wheezing around mile 90 including the inability to take full breaths. After the race I had a nasty coughing bout, with symptoms lasting a few days before clearing up. I went to the doctor, got a z pack, and forgot about it. Since then, I’ve completed 17 other races of 100 miles or longer, and each time I experience some version of this condition to varying degrees. Most of the time symptoms don’t pop up until about an hour or two after I’ve completed the race, at which time I tend to hack up a large volume of thick, usually dark, mucus. I usually have to go through this clearing process before I can sleep, which is very frustrating – I also tend to take my first post-race nap in a car or on a couch, as laying down flat is almost impossible without coughing. Typically the symptoms are gone within 6-8 hours, although I will occasionally have some minor breathing issues for a day or two. Cold and wet weather tends to make the condition come on faster and remain longer, but high altitude doesn’t seem to make it any worse. Training runs and races of shorter ultra distances have never brought on any symptoms. I’m interested to hear other stories and any further research into these occurrences. For me, I just chalk it up as part of what happens to me during a 100 miler, along with stomach discomfort and hallucinations. Great article and unfortunately I relate, as I commonly experience breathing difficulties in the late stages of hot, dry dusty races– its accompanied by tightness in my vocal cords, and it does not respond to an asthma inhaler. I’ve never seen such a clear explanation of what may be causing this- Thank you! One question though: The article describes using breathing techniques to deal with this, such as “… inhaling through pursed lips or forcefully through your teeth”; and mentions seeing a treatment involving “inhaling through a straw”. I cannot imagine doing that as it already feels like I am breathing through a straw when this kicks in. Pursed lip breathing, as I have understood it, and employed it with some benefit in these situations, involves exhaling through pursed lips, to create a bit of back pressure to open the airways. Could you please clarify? Thanks for your thoughtful question. What I should have mentioned is that these techniques are not generally applied on every inhalation during an episode. There has been a lot of success in having athletes inhale through pursed lips, through the teeth, or by pushing your tongue to the roof of your mouth every 3rd or 4th breath. What this does as you mentioned is change the resistance of air hitting the back of the throat where the laryngeal obstruction is occurring. In all of these techniques, on every 3rd/4th breath, you change the resistance from high inspiratory resistance to low inspiratory resistance (breathing through an open mouth). This alteration seems to relax the vocal chords creating a larger(more normal) open airway. As mentioned in the article there is likely a stress/anxiety component of EILO and obviously that can lead to a vicious cycle of increased panic when you can’t breathe, it’s a scary experience. Simply calming the athlete down is a compounding variable when it comes to research on the breathing techniques used as treatments. thank you, a fine overview. “an overuse injury of the lungs” is a good term for the exercise-induced constellation of breathing ailments. The sad part is that lungs aren’t trainable, so once this hits it’s game mostly over. The distinction is as outlined here, EIIS is on the inhale, EIA/EIB on exhale. For me the diagnostic is from a peak flow meter. Normal is now 600-650, if I try to run without using an inhaler first it will be 450-500 and all kinds of unpleasing wheezing. For EIIS/VCD the peak flow will be unchanged, so that’s one way to tell which is going on. In those days (2005) the VCD therapy was provided by voice therapists, plus anti-anxiety protocols, meditation, breathing exercises etc. I’m not sure if it’s changed since then. Even with an inhaler I found I also get something else exercise-induced, exercise induced arterial hypoxaemia. This is defined as an arterial O(2) saturation of 93-95% (or 3-4% <rest), moderate EIAH as 88-93%, and severe EIAH as <88%. Testing with a pulse oximeter and on treadmill exercise tests, I can run myself into the low 80s quite easily. They stopped the treadmill test in alarm when I hit that, I was still OK with it, nowhere near blacking out. Ha. That rather confused the EIA/EIB diagnosis but it turns out EIAH is fairly common among inveterate aerobic addicts. The Front (st)Range of CO is generally terrible for breathing disorders – some combination of altitude, dry air, pollution, ozone, etc. Several college friends of my sons report they hardly need their inhalers at college at lower altitudes\more humidity. My son only needs his during swim season now, which suggest a chlorine-induced form of EIA. I am a physiotherapist working with athletes with EIA/EIB/EILO or simply ‘dysfunctional breathing’. As you say the most important part is getting a diagnosis. While the lungs themselves are not trainable as Doug says in the comments the muscles involved in moving air in and out of the lungs are highly trainable and dysfunction here can be a major cause of EIB/EIA and EILO. 1. They are over breathers at rest i.e. the rate and or volume of breath is over and above the requirement of the body. Chronic hyperventilation is subtle, can cause a number of physiological effects and is hard to identify and self correct as the overriding symptom will be a feeling of lack of air not too much of it! Over breathing causes a drop on carbon dioxide in the blood which causes smooth muscle constriction. Smooth muscle wraps around airways = bronchoconstriction. It is also exhausting and often a component of anxiety, chronic fatigue and can mimic more serious cardiac or respiratory issues. If you sigh or yawn frequently or have a feeling of not getting a satisfying breath at rest this could be a consideration. As always get checked out. 3. They are habitual mouth breathers – cold dry unfiltered air hitting the lungs can be starting that process of irritation before any effort. 1, 2 and 3 are essentially caused by stress, be it busy brain, anxiety, huge training load on top of full time work or postural stresses at work. 2. Care of your lungs starts at the nose – use it, rinse it get it checked out if you think there is obstruction there. 3. Stop sucking your guts in – corseting by the abdominal muscles prevents your diaphragm moving, causes pressure down on the pelvic floor muscles, in the mid section ( contributes strongly to reflux) and ultimately the other end of the pressure system – the vocal folds. Great article and really helpful comment – thanks for sharing! This tends to be my primary symptom, sometimes presenting during exertion, particularly when I start a run with a climb: “If you sigh or yawn frequently or have a feeling of not getting a satisfying breath at rest.” Most common when I’ve ramped up my running volume. After 3 Hardrock finishes with no problems, I began developing EIB in subsequent races there. I managed to finish 3 more times with symptoms on the course. It’s no fun. No problems on other courses like UTMB or WS. 2) Train nose inhales with lip compression to get this effect to cut wheeze. i first had this experience 10 years ago when i started lifting weights. on the days that i maxed out, while driving home, i had very hard time breathing and threw me into panic, and felt i was going to black out. i tried to remain calm, and breath slowly, and after about an hour or two, it went away. this happened few more times, and i went to my doctor and he said i had EIA. since then, i stopped lifting weights, and started running. i have a prescription for emergency inhaler, and pro-air. although i have never used the emergency inhaler since stopped lifting weights, i learned to use pro-air while running long distances. if i know i have a hard workout, i will use two pumps of pro air. i will also take pro-air with me on long runs during hot or cold days, since i have had breathing problems early in the morning in cold air, hot afternoon days with high pollen alerts or smog in the past. it feels like i have 50% of my lunch capacity, and breathing deep leads to coughing. during an ultra, i will take two pumps of pro-air every 4-6 hours or when i feel breathing starts to get restricted and i can sense wheezing. i will also decrease my efforts and start to breath out more than i breath in (3 steps in, 4 steps out for example) which seems to help me get calm if anything. just this past weekend, at canyons 100k, around mile 55, i started to feel it even though the weather was cool, but it was spring so pollen count may have been high, it may have been my consistent stronger efforts caught up with me… i took two pumps of pro-air, walked a lot more, did my breathing exercise, and eventually it got better, but not gone. for now, this protocol has helped me to deal with my EIA, though i wish i didn’t have this problem or have to use pro-air. I am a 69 y.o., white, male who has been primarily a runner (up to the road marathon distance) for 40 years. Four years ago during a cold 5k race I had a sudden breathing problem at 2 miles. This never occurred to this extent where I was made to stop, wheeze, and cough. I have since had this experience happen more frequently than not and never really know if it will happen during a run until it does or does not. When it does occur it will happen between 5 and 15 minutes into the run. I have been lab tested and diagnosed with mild asthma and I have been on a medical program involving Advair Discus inhaler 2xdaily, Theophylene 2xdaily, and ProAir as needed. This has not noticibly had any effect. Now, with a new Dr., I am on less meds but started Omephrzol for possible GERD causing the breathing attack. There does not appear to be any improvement…yet. Your article covered all of my symptoms and “theories” I have been told by Dr’s over the last 4 years. Cardiac stress testing has not brought an attack on and the breathing attack happens only running and not with my other aerobic workouts. All of my “training” runs and races have brought me to my expected,run-stop-cuss-jog-AND REPEAT…… my clothes are “shrinking”!! Calories in-no calories out….. I will continue to monitor the rare but usually informative blogs and postings like your excellent article. Great article! I dropped at HR 100 this year at mi 58 with breathing difficulty (and trashed quads). I had been out 3-4 weeks pre race for a big mileage and high altitude week. I expreinced severe respiratory symptoms by day two and by day 5 could hardly breathe walking from the car to the restaurant. I was hitting 14-18 miles each day on segments of the HR course. I was moving slower and slower each day. I hit up Dr. Halvorson who suggested medical eval. Turns out I have a PFO, small and likely insiginificant…except at altitude. My cardiologist scratched his head at my pulmonary function test during exercise though. He said my heart did great on the CPX – exercise cardiopulmonary/Vo2max test, it looked like my pfo was no big deal, but my my lungs pooped out, my breathing reserve was very low. Sooo, more pulmonary function tests and likely a visit with a pulmonologist. I am wondering if I may have EIB and some remodling that has affected my ability to perform. I have never had asthma, never smoked, rarely ever get a cold or cough. I just have found over the past 1-2 years that I can’t breathe as well when I climb at races, especially at altitude. Would love to be part of a study. Excellent article on the topic. One should review these two open access research articles which are relevant and address the possibility of adapting to a nasally restricted approach to breathing as a means of both preventing and treating ongoing EIB This approach requires some time and the need to gradually down regulate one’s response to breath to breath end tidal CO2 responses so that air hunger disappears. The second article also suggests the possibility of improved running economy once nasally restricted breathing is possible at all levels of exertion.